Moon Under Water | 15,000kms of Food! Within the Andrew McConnell’s Builders Arms Hotel, there exists a little dining room called Moon Under Water. Whilst in the same building, this is distinctly different from the bar and bistro. For one thing, the menu is a set menu every night at a fixed price. Another is that it’s blindingly white in the dining room – I felt like if I had worn an all white outfit, I would have disappeared into the room itself. But we are not here to talk about the color of the room but the food, which was brilliant. The menu we had that night was perfect for me as jamon, scallops and chicken are some of my favorite things! We started with deliciously savory cheese biscuits. 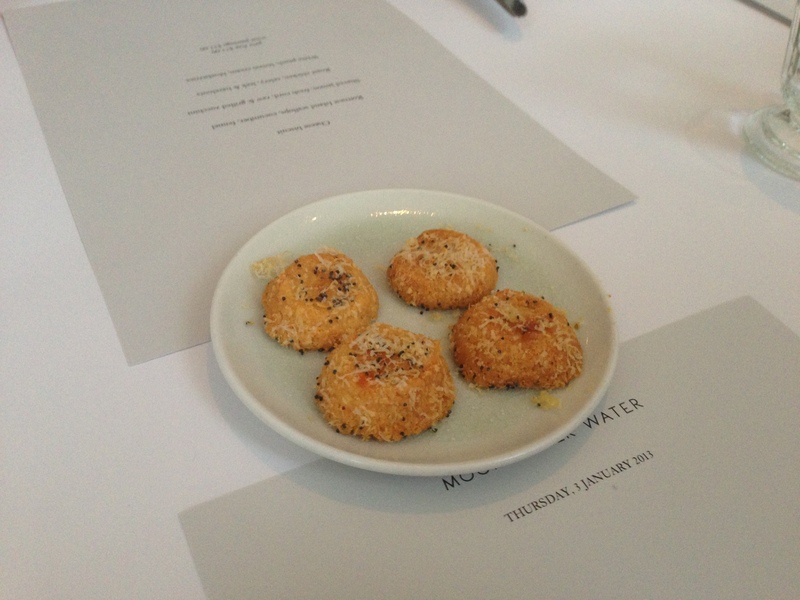 I’m a big fan of cheese biscuits, such as Phillipa’s Parmesan Sables so this was a similar treat. 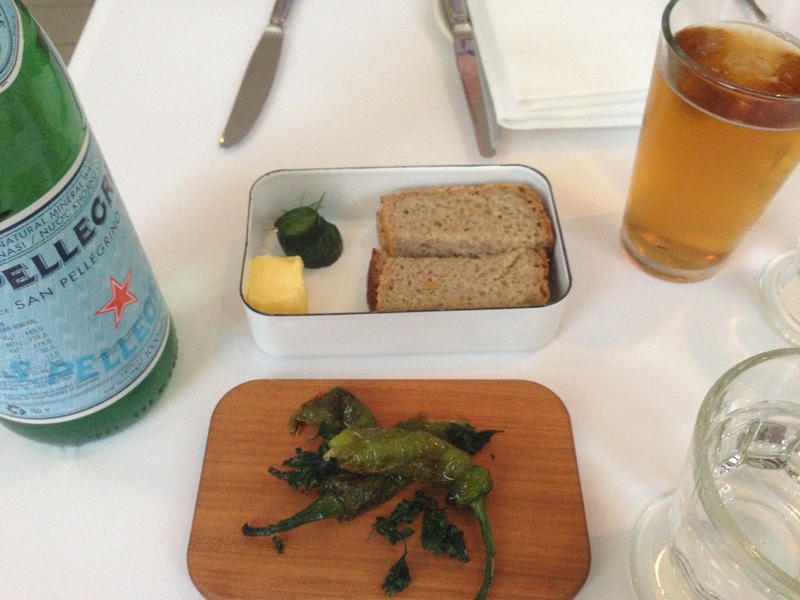 We were then presented with some grilled peppers, and bread, butter and pickles. I love surprise peppers, but unfortunately for me, I didn’t get any that were tongue numbing. 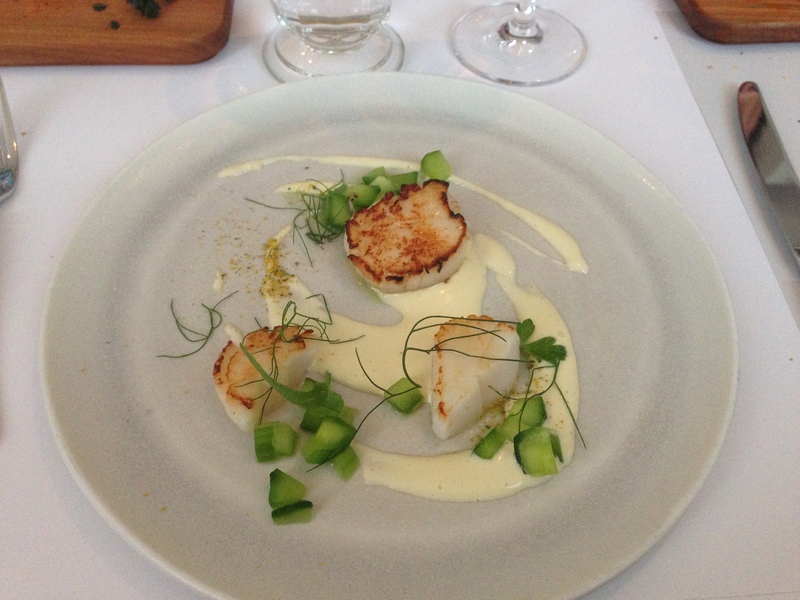 The Rottness Island scallops, cucumber and fennel was a beautifully light dish with flavors and textures that married very nicely together. 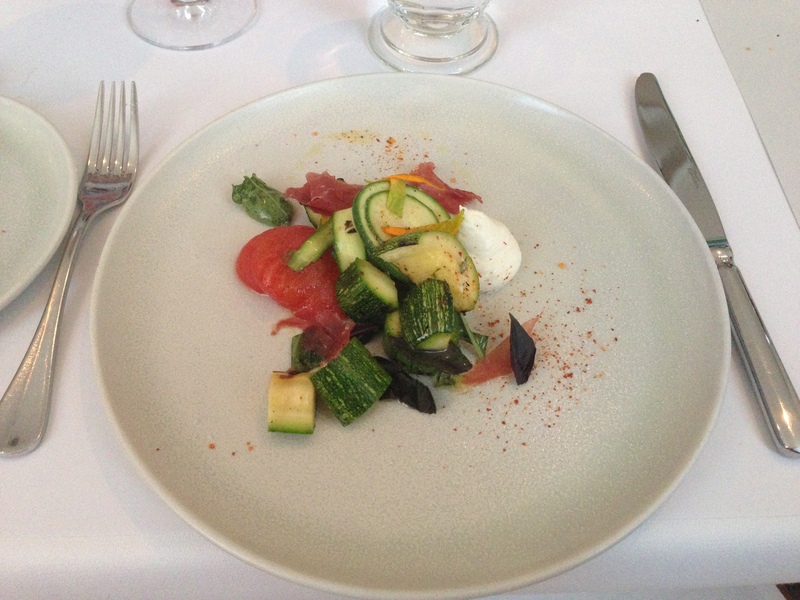 The shaved jamon, fresh curd, grilled and raw zucchini was a huge surprise to me. It was light, it was fresh, the texture was amazing and it tasted fantastic. Who knew you could make the humble zucchini taste so upmarket? 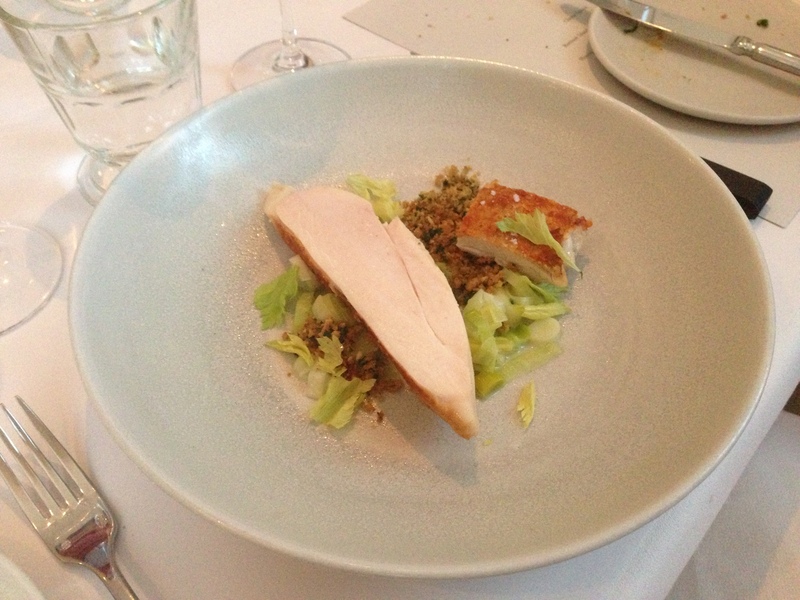 I love a good roast chook and the roast chicken, celery, leeks and hazelnuts dish was amazing. The chicken was cooked so perfectly (moist and tender) and the accompaniments matched it beautifully. 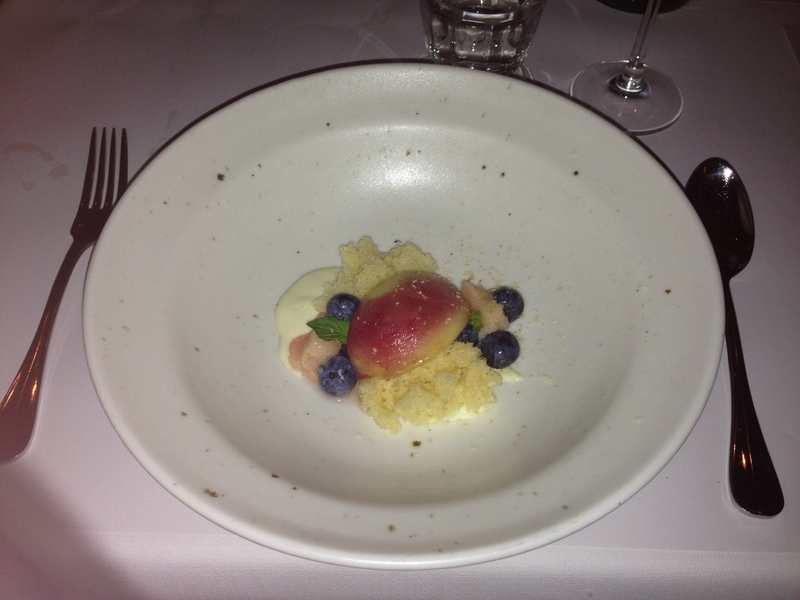 I like light fruity desserts, so the white peach, lemon cream, blueberries was a great way to end the meal. The peach was poached, and served along with the cream and fruit were soft fluffy pieces of cake. Very nice. 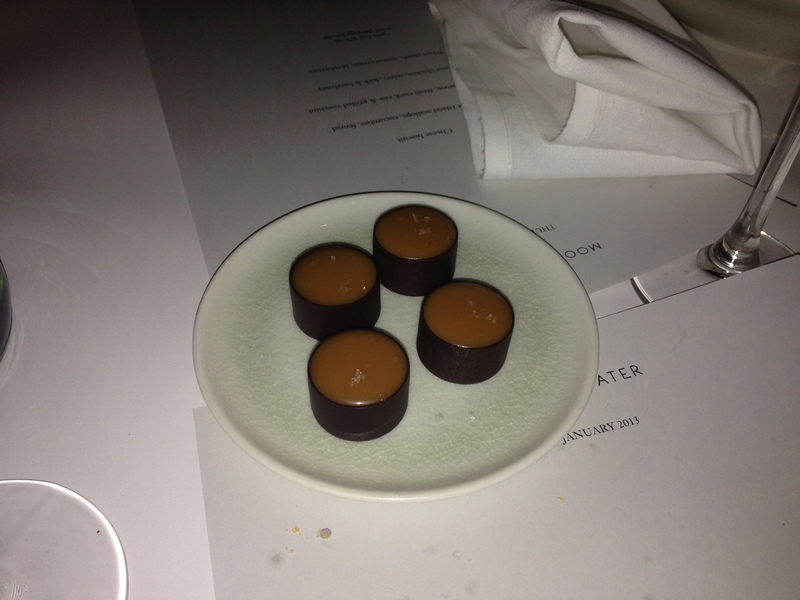 Lastly before departing, we were presented with caramel filled chocolate cups. It was a rich mouthful to end the dinner with. Don’t expect big pub/bistro type meals here – it’s all light and fine. Perhaps they change their menu when the weather cools down, but this was what we had in early January. I think it’s good value for money, and would definitely go again.